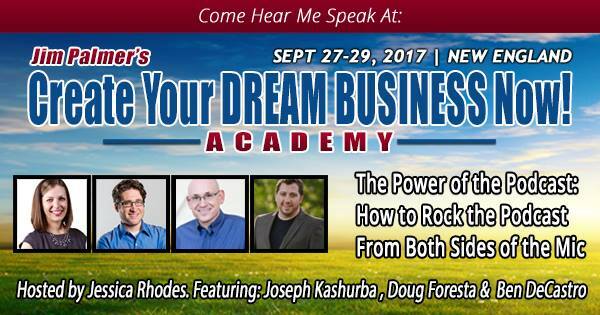 This week’s episode features Jess doing a LIVE panel discussion at Dream Business Academy! Do podcasting because it’s fun! Not everyone likes the new format of the show, but all that matters is that Jess is having fun! Joe, what is the value of being a guest on podcasts (even small ones)? What is the ROI of podcasting? How long does it take? Joe, what role does podcasting play in your content marketing? What should your goal be for creating a podcast? Every successful show has a script or an outline- PLAN AHEAD! How can you podcast well? What are the dos and don’ts of pitching a podcaster? Fully understand the genre and why you are a fit! What’s the importance of your press page and online presence? What’s the importance of a one sheet?